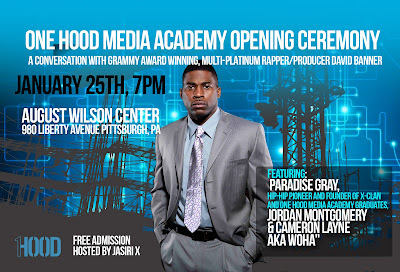 One Hood Media Academy’s opening ceremony will be held at the August Wilson Center for African American Culture on January 25, 2013 at 7 p.m. with special guest, Grammy award winning, multi-platinum artist David Banner. A Conversation with David Banner will include an in depth discussion with David Banner regarding the Black male image in Hip Hop, his career and current activities, as well as current state of Hip Hop. 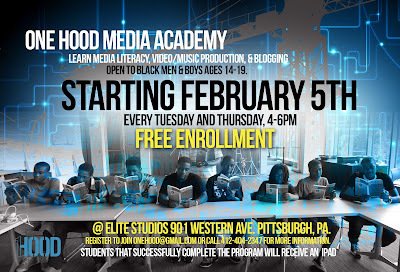 The ceremony will also feature a performance by One Hood Media Academy graduates Jordan Montgomery and Cameron Layne. Emcee and community activist Jasiri X is the creative force and artist behind the ground breaking internet news series, This Week with Jasiri X, which has garnered critical acclaim, thousands of subscribers, and millions of internet views. 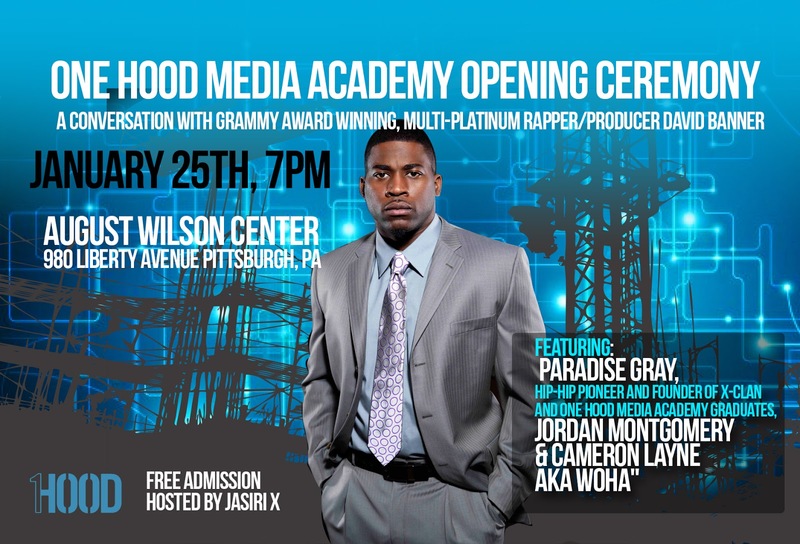 A six time Pittsburgh Hip-Hop Award winner, Jasiri is the first Hip-Hop artist to receive the coveted August Wilson Center for African American Culture Fellowship. Paradise “The Arkitech” Gray, founding member of XClan and the Blackwatch Movement, is the man behind the camera responsible for framing the images that make the Hip Hop series so unique. Paradise’s work as an elder in the Hip Hop community is rivaled only by his work dedicated to issues that effect the disenfranchised of the community. If you would like more information regarding this topic, or to schedule an interview with Jasiri X or Paradise Gray please call 412-404-2347or email jasirix@gmail.com. Another example of why mainstream media has to be ignored and we must continue to be forthright telling our own news and commentary. This type of story makes a Black person feel good because we are not in isolation fighting against this beast!! !